Joaquín Rodrigo was one of the greatest composers of piano music from Spain. Although he was blind from an early age, he wrote highly original piano music of great brilliance and passion. This concert of his piano music highlights some of his greatest masterworks for piano solo, such as Cuatro piezas [4 Pieces], A l´ombre de Torre Bermeja [In the Shadow of the Torre Bermeja, and works for piano, 4 hands Juglares and the ironic Gran marcha de los subsecretarios [Grand March of the Under-Secretaries] and other works. We will be joined by Cecilia Rodrigo, daughter of the composer and President of the Fundación Victoria y Joaquín Rodrigo. DATE: Thursday, April 4 , 2019. Isabel Pérez has appeared in solo recitals and chamber music concerts in New York at the Stern Auditorium, Zankel Hall, and Weill Recital Hall at Carnegie Hall, Lincoln Center, Steinway Hall, Tenri Cultural Institute, Yamaha Center, DiMenna Center, Liederkranz Foundation, Rachmaninoff Hall at the Tchaikovsky Conservatory in Moscow, Sala Manuel de Falla, Ateneo de Madrid, and Sala Arturo Benedetti Michelangeli in Bolzano, Italy. She was a prizewinner at the American Protegé International Piano and Strings Competition (2nd Prize), Grand Prize Virtuoso International Competition (3rd Prize), Ciutat de Berga International Competition (1st Prize) and the Cidade do Fundao Piano International Competition (1st Prize), as well as the recipient of the Jorge Bolet Distinguished Performer Award at the Stony Brook International Piano Festival. She recently performed at the Concert for a Sustainable Planet at Carnegie Hall along with cellist Yo-Yo Ma and members of the New York Philharmonic. In January 2018, she was a soloist with the Real Filharmonia de Galicia Orchestra under the baton of maestro Diego Masson. Isabel has taught masterclasses at the Manuel Peleteiro Conservatory and the New York University´s Undergraduate Collegium. She has also given lectures and speeches at the Nobel Peace Prize Forum, United Nations General Assembly, ECOSOC Youth Forum, European Parliament within the European Arts Forum, I Jornadas Sostenibilidad e Instituciones Culturales, University of Michigan, University of Vechta, Columbia University, Carnegie Hall, and Casina Pio IV at the Vatican. 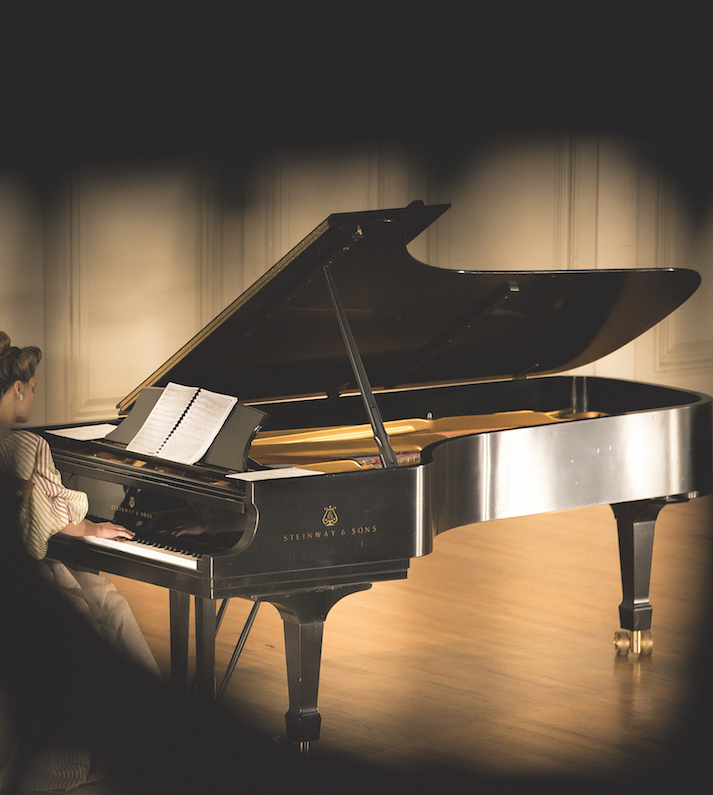 She has also participated in Música en Compostela, Gijon International Piano Festival, and the Summer Institute for Contemporary Performance and Practice at the New England Conservatory, among other festivals. In 2016, she organized the Festival Granados: Composer, Pedagogue, and Virtuoso at New York University, a series of lectures and concerts about Enrique Granados in which she premiered a newly reconstructed version for piano quintet of Granados´ Concierto Patético by composer Sergi Casanelles. At age 25, Isabel Pérez Dobarro is a Ph.D. candidate at NYU Steinhardt. She holds a Professional Studies degree from the Manhattan School of Music, a master’s degree from NYU and a bachelor’s degree from the Real Conservatorio Superior de Música de Madrid. Isabel is a member of the Executive Board of the Piano Teachers Congress of New York and co-chair of its Honors Program. She is the UN Focal point at the United Nations Sustainable Development Solutions Network Youth, President of the Beta Pi Chapter at the International Honors Society in Education Kappa Delta Pi, and the Western European Representative of the Fair Air Coalition. She obtained a J.D. in law from UNED and has completed courses in U.S Law and Methodologies courses at NYU SPS. She is currently a graduate certificate student in International Relations at Harvard University and an online student at the Harvard Business School HBX. American pianist Douglas Riva has gained international recognition for his profound knowledge of Spanish music, and no less an authority than the distinguished Spanish composer Xavier Montsalvatge has described him as “an exceptional pianist.” Douglas Riva’s interpretations of the works of Enrique Granados have earned him his reputation as today’s leading exponent of Granados’ piano music. His recordings for Naxos of the complete piano works of Granados, comprising 231works including 102 World Premiere recordings have won worldwide critical acclaim. Spanish critics writing in Scherzo praised Mr. Riva’s interpretation of Granados’ masterpiece as “belonging to the privileged class of the very best versions of Goyescas.” Referring to Vol. 7 of the series Scherzo also described Mr. Riva as “an absolute authority, an excellent pianist who is as poetic as Granados’ music.” London’s The Guardian described Vol. 3 of the series as “a totally compelling performance [that] demands to be heard”. Douglas Riva is the Assistant Director of the eighteen-volume critical edition of the Complete Works for Piano of Enrique Granados, directed by Alicia de Larrocha and published by Editorial Boileau, Barcelona. In 2016 the Complutense University, Madrid, published his critical edition of the complete orchestral works by Granados, including the first publication of 8 works. Mr. Riva recorded one of these works, Elisenda, with the City of Granada orchestra, directed by Cristóbal Soler, for Deutsche Grammophon. Mr. Riva has performed at the White House, Carnegie Hall, Queen Elizabeth Hall and numerous festivals Brazil, Spain, Portugal, Holland, and the United States. He gave the first American performance of a newly discovered Scarlatti sonata at the National Gallery of Art and the world première of Gazebo Dances by John Corigliano. Granados’s long-lost masterpiece Cant de les estrelles for piano solo, organ and choruses was performed for only the second time in history by Douglas Riva and the Voices of Ascension, directed by Dennis Keene in 2007. The Naxos recording of the première performance, Song of the Stars, was nominated for a GRAMMY award. Mr. Riva began his musical education at the age of nine, studying both the piano and the flute. His professional career began at the age of sixteen as the Principal Flutist of the El Paso (Texas) Symphony Orchestra. Later, devoting himself exclusively to the piano, he continued his studies at the Juilliard School, New York University, and in Barcelona at the Academia Granados-Marshall, founded by Granados. A frequent lecturer, in Spain and the United States, Mr. Riva has lectured at Harvard University, New York University, the University of California, Riverside, Graduate Center of the City University of New York and in Spain for the Sociedad Española de Musicología, Madrid and the Real Academia de Bellas Artes, Canary Islands.